It’s Important To Take A Stand. I am a fiscal conservative. That makes me a man without a party. The one steady thing I admired about the Republican party, at least until recently, was that they didn’t like debt. “If you were against President Obama’s deficits, and now you’re for the Republican deficits, isn’t that the very definition of hypocrisy?” Senator Rand Paul said as he held up passage of the budget bill for a few hours — perhaps until he realized that the definition fit him, too, since he had voted for the tax cuts that will blow up the deficit. Rand Paul is a maverick who stands up for what is important to him but even he is not beyond hypocrisy. Sometimes I get tired of waving the absurd military spending in this country but it needs to be said again and again. We in the US make up about 5% of the world’s population but spend more on our military than the rest of the world combined!! Where other countries spend for the well-being of their citizens we spend much of those resources to overwhelm the world with our military might. I hope that the Post Trump Republican party can eventually return to their roots of fiscal conservatism but I kinda think given the Pennsylvania election this week they have damaged their brand so severely even that would not prevent their destruction. Since the second world war, British foreign policy has been built on its so-called special relationship with the United States, which emerged from that conflict as the world’s most powerful nation. This week, London showed it was attempting to build another special relationship, with China, the world’s fast-rising power that is on its way to challenge US dominance in global affairs…. Britain is known for its pragmatic diplomacy. For instance, it was not only the first Western nation to recognize the new communist republic in 1949, but did so even before the Soviet Union for fear of a possible communist military takeover of Hong Kong. British foreign policy is best summed up by the words of 19th-century prime minister Lord Palmerston: “We have no permanent allies, we have no permanent enemies, we have only permanent interests. I love the words “We have no permanent allies, we have no permanent enemies, we have only permanent interests.” It takes a pragmatist’s mind to come to that realization. We have been in war after war in my lifetime and usually withing a score of years our enemies become our friends. The big one for my generation was Vietnam. We lost over 50,000 boys in that war. Now Vietnam is one of the premiere travel destinations for many in this country. While Great Britain (I don’t know if they call themselves “Great” anymore) was the world power they, like we do now, made many blunders but they always seemed to land on their feet so to speak. Because they have a parliamentary form of government they are used to forming coalitions to accomplish things. Their diplomacy follows suit. They recognize what needs to be done to further their overall goals and then proceed to make that happen. Too many of us in the U.S. get stuck in a mode of thinking that seems impossible to get out of. One of those things is socialism. Say that word to many here, including politicians, and all they can think of is the “evil empire” USSR. We came close a couple of times in destroying the earth over our differences so anything that they do must be wrong for us. Britain on the other hand embraces socialism as a pragmatic solution to many of society’s problems. Socialized medicine works well there and keeps the cost of healthcare much more managable that we have ever been able to attain. Now Britain is using a pragmatic approach to China. They realize that China is becoming a prime economic power in the world. They don’t get stuck on the “communist” label as a reason for demonetization. Pragmatism is one of those things that we need to import much more of if we hope to be relevant in tomorrow’s world. That and to finally come to the realization that we can no longer afford to be the policemen of the world before it breaks us under its load of debt. These words of wisdom were just as ignored in Will’s day as they are today by almost all of us and especially by our government. Obviously this quote was said long before even Grover Norquist’s parents were born but it is equally true today as it was in Will’s time. The fact of the matter is up until President Bush, taxes have always gone up to help pay for our wars. But when so many from the GOP crawled up to the altar of Mr. Norquist with their pledges to NEVER raise taxes this tradition was very unwisely flushed down the toilet. When will we ever learn to never say never? Sometimes it seems that those guys in congress love their party more than the love their country. I don’t know; I’m just a simple guy but it seems that way to me. Source: Bush Breaks 150-Year History of Higher U.S. Taxes in Wartime – Bloomberg. Unlike apparently Mr. McCain I am a history buff and I firmly believe in learning from the past in order to keep from making the same mistakes over and over again. The sharpest rise in the national debt in the last sixty years came as a result of taking President Bush’s wars “off the books”. It is the primary reason we are where we are today. As Will says their doesn’t seem to be a congressman, especially those of the GOP variety, who have the nerve to ask at least some of the voters, especially those who have profited greatly during these times, to help pay for these wars. It seems pretty simple to me that if wars are necessary then asking citizens to pay for at least part of them is the right thing to do. But maybe the problem with this one, and in fact most of them in my lifetime, is that none of them were really necessary. When we get into hard times in this country we have always asked those who are much better off than the rest of us to chip in a little of their wealth to help out and in the past they have for the most part gladly done so. There is a bible verse that goes something like this, “For those who have gained much, much is expected”. When will we start living by that code again? War Jobs vs Peace Time Jobs…. Source: Defense cuts could further dim US jobs picture – Life Inc.. There are thousands of civilian jobs related to the war effort, and cutbacks in defense spending have already led to reductions in these defense-related jobs, including direct government positions or those with defense contractors. Outside of slightly more federal money spent on citizen’s safety nets the defense budgets are the biggest use of our tax dollars. We spend more on our military than the rest of the world combined. As shown by the quote above and the source article one of the arguments our hawks give us for maintaining our military spending is that it creates much needed jobs. 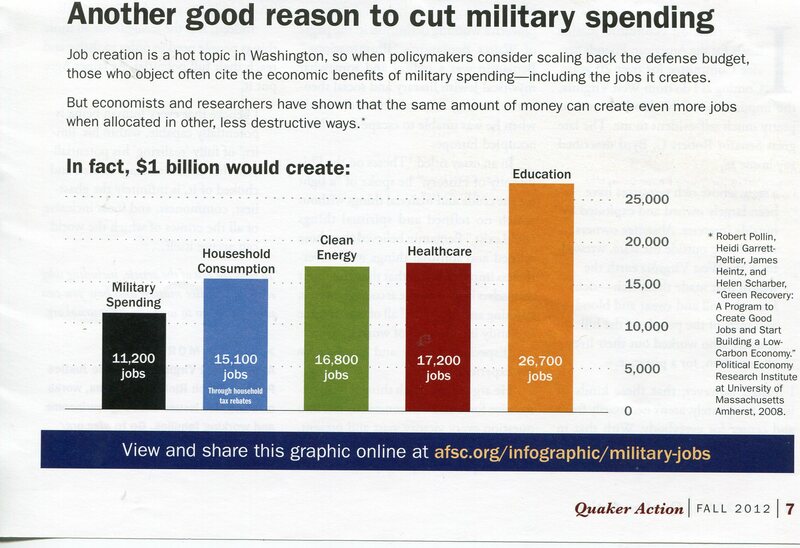 The graph below provided to me by my friends at the American Friends Service Committee show that the same money could produce many more jobs if spent outside of our military complex. The only reason we spend as much as the rest of the world combined on our military is because our politicians and generals have chosen to make us the policemen of the world. We are expected to spend our money and our young people’s lives no matter where the conflict is in the wold. But can we really afford to do that even if we as a population want to which the majority of us clearly don’t? It has been shown time and again that given a choice between military spending and domestic spending the majority of us choose to reduce military budgets. So, why do we allow others to continue down this insane path of bankrupting ourselves to “make the world safe”? Shouldn’t we ask, or even require, those more affected by the conflicts to step up and bear more of the responsibility. Of course they won’t volunteer to do that as long as they can count on us to do it for them. Why should they spend their money and kid’s lives when we will so willingly do it for them? The problem right now is who to vote for to make this change happen. It seems that the Obama administration has adopted the Bush wars as their own. At least they are finally putting a time line on the withdrawal of many of our troops. But they don’t tell you about the thousands of our young men who will be left behind. We have so many troops spread out around the world that even that costs us $billions to maintain. Nothing will change until enough of us say “enough”. Bring our troops home and out of harm’s way. They belong with their families not stationed around the world protecting many who don’t even want us there. We simply can’t continue to put all the debt to maintain this absurd military/industrial complex on our grandchildren. Your voices are needed to make this happen.